Statement: "Since childhood she has been very interested in the way people understand each other. Since she wrote her PhD dissertation about infinitesimal calculus and time measuring in language she has been looking for a more scientific way to understand the subject. That was when she got interested in physics. 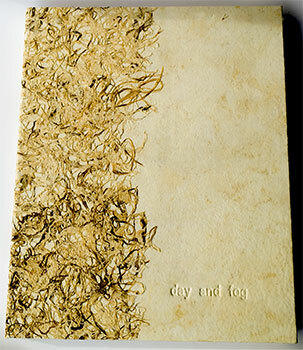 She makes artist's books in which combines texts and images." Buenos Aires: Mado Reznik, 2016. Edition of 10. 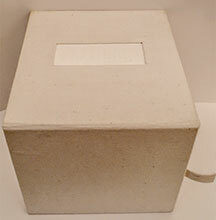 13.75 x 17 x 1.5" custom box with cavities for etchings and the book. Four 4.75 x 6.75" etching windows with roll up shades on dowels. 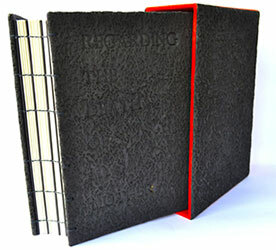 Book: 8.5 x 11", 14 leaves; lightweight paper covers; perfect bound; cord lift and tie. Materials: paper, ink, cloth. Theresienstadt, a concentration camp established by the SS during WWII near the city of Terezín in occupied Czechoslovakia, was the showplace camp gussied up by the Nazis after D-Day for a visit by Danish and International Red Cross officials. The intent was to dispel notions of exterminations camps. This work commemorates the artist's recent visit to what remains of the camp. Mado Reznik: "day and fog is part of a journey taken several years ago. It comes from a survey about the Terezín ghetto in the Czech Republic, where art was legally promoted by Nazis but also [pursued] illegally by the prisoners. Terezín was the chosen ghetto to be shown by the Nazis as a tactic to oppose the world opinion about the horrendous and dreadful conditions of the camps. And, so to a certain extent art was promoted and even a huge library of more than 50,000 books was assembled. Both adults and children were involved in survival not only trying to get enough food and warmth but also literature, visual arts, music, theater, philosophy. "My own personal pictures taken at the ghetto have been transformed into photo etchings. Paper rolls intend to express what we remember but sometimes tend to ignore as if meaning has been compartmentalized. Poems express part of the story in a voice that transcends my own voice. I have chosen different types of paper for that objective: Japanese, Mexican, and Nepal." Buenos Aires: Mado Reznik, 2016. Second Edition of 10. 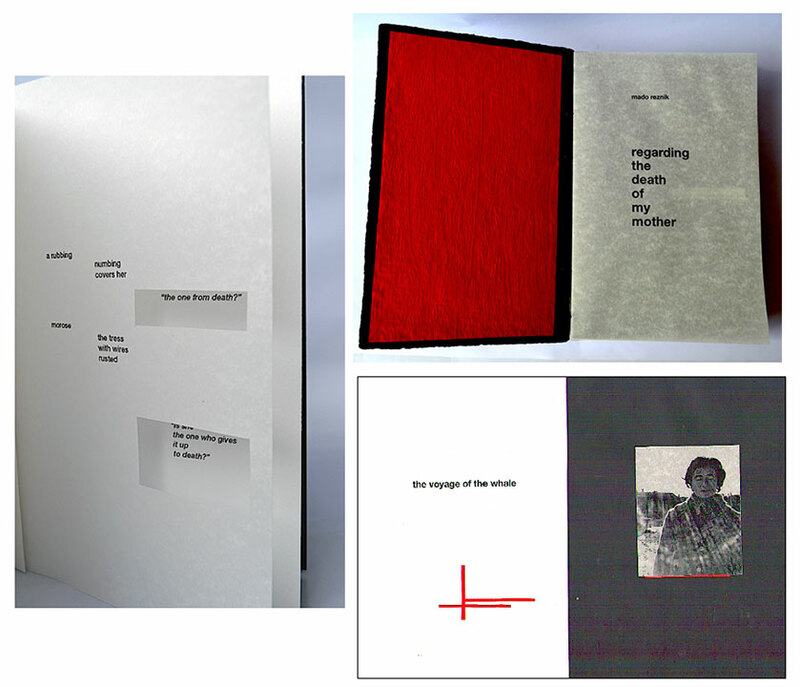 Mado Reznik: "Regarding the death of my mother is an artist book where pictures, poetry, and paper are intertwined. The book is divided in four sections where two female voices are heard. These voices are from memory shown through different types of paper and windows that connect lyrical states and pictures. Although the title refers to death the entire book moves around life and its celebration." 6 x 8.5"; 20 leaves text, 4 illustration leaves. Encaustic painting. Monocopies. Numbered. Translation into English by Christopher Lovelace. Bound in paper-covered boards with encaustic painting on cover. Numbered. Mado Reznik: "The Warranty of Dreams is a book about dreaming and memory through poetry, etchings, and encaustic painting. All these concepts are translated with words, papers, ink and painting. 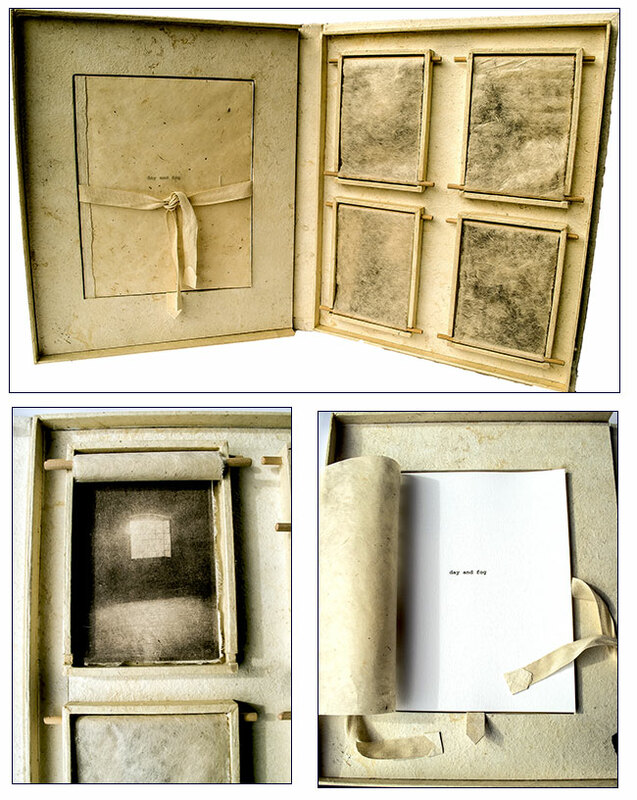 The book serves as a voices' container and transparent etchings are part of the impossibility of saying all." Buenos Aires: Mado Reznik. Edition of 2. 6.5" cube. Cloth covered. Text embossed. Numbered. 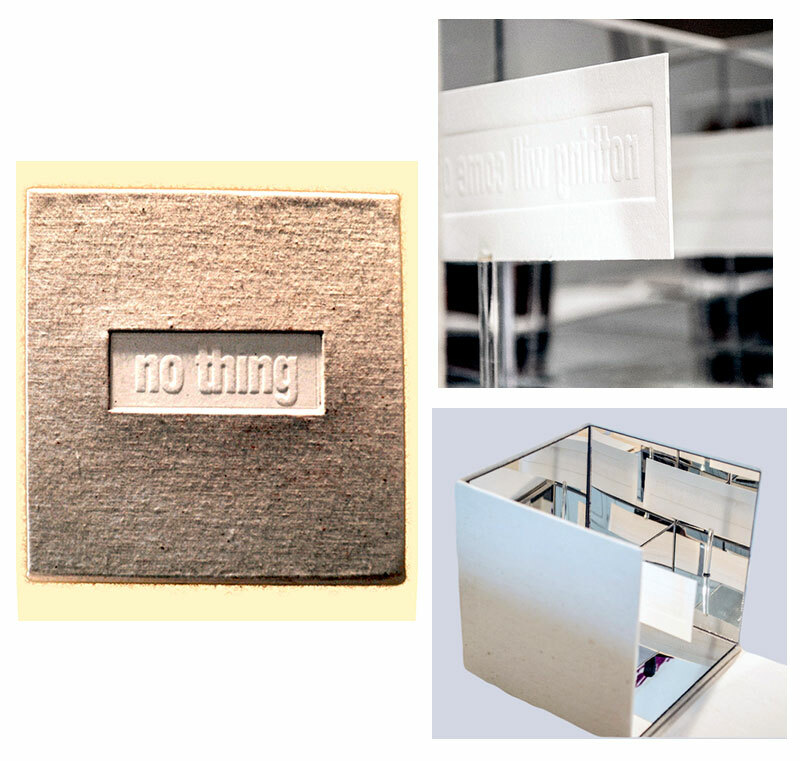 Mado Reznik: "No Thing is a conceptual book about the idea of nothing (ness). The box contains a series of mirrors that reflects ad infinitum the famous line in William Shakespeare´s King Lear, in which Lear declares: 'Nothing will come of nothing'. "Whether you talk about love and legacy (like in King Lear), money, or any other concept, you still need to name things. You need to name nothing in order to talk about nothing. To appreciate the whole reflection the viewer needs to approach the box and like inside a paradox the viewer will be immersed in the universe of nothing (ness)."